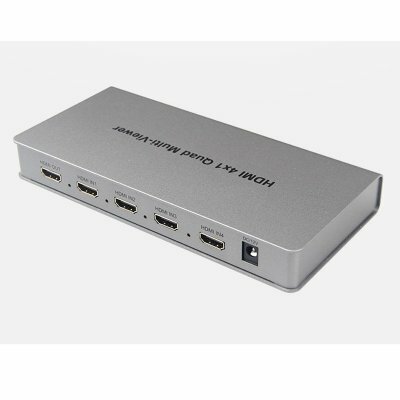 Successfully Added HDMI Switch – 4 HDMI Ports, 1080p Support, Easy Set-Up, IR Control Support, Compact Design to your Shopping Cart. This compact HDMI switch allows you to easily connect all your HDMI systems to your television set. If you’re looking for a way to increase the number of HDMI ports on your TV, this switcher is perfect for you. It comes with a total of 4 HDMI ports that allow you to conveniently connect different systems to your TV. By supporting up to 1080p resolutions, you can enjoy the latest media in crisp Full-HD. This HDMI switch supports IR control, meaning that you can operate it through your remote control. With its 4 screen segmentation option, this electronic gadget even allows you to watch four screens at once at your television set. Whether you use it for DVD, Blu-Ray, or your security camera – this HDMI switch is guaranteed to meet your demands. The gadget itself features a simple plug and play design, making it easy to use by anybody out there. This HDMI switch comes with a 12 months warranty, brought to you by the leader in electronic devices as well as wholesale electronic gadgets..